Tasty Soy Garlic Shrimp Are Colossal Delights! The next time you're strapped for time, try this soy garlic shrimp recipe. It takes just minutes to prepare and even less time to grill to perfection. Give these shrimp a light touch of smoke and you've got something special! For this recipe, choose large shrimp...colossal size U12 or greater is perfect. Make sure that they are de-veined, but don't remove the shells before grilling. The shell helps the shrimp retain its moisture as it cooks, plus it adds extra flavor. The flavor of the marinade will be absorbed into the flesh through the split along the shrimp's back. This shrimp recipe requires just a few ingredients, that can be put together and then grilled in a flash. Start with U12 (under 12 per pound) shrimp. The larger size is easier to prepare and to eat. I think it's worth the extra cost. But if you prefer, smaller shrimp will work just fine. They're just a little more labor intensive. For the marinade, combine one quarter cup of soy sauce with one quarter cup of brown sugar. Add one or two chopped cloves of garlic to the mixture, then add it to the shrimp. Work the marinade into the shrimp, then let the little boogers rest as you preheat the grill up to high. In about ten minutes, the grill will be hot and the shrimp will be ready for cooking. And before you place the shrimp onto the grate, place a foil packed holding a few wood chips over one of the burners. When flavored with a kiss of smoke, these are really great. When the wood starts smokin', it's time for grillin'! 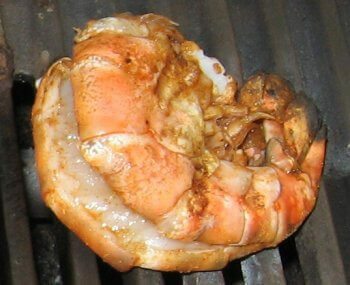 Pop the shrimp onto the hot grill, close the lid, and let them cook for two minutes. Turn the shrimp over and continue grilling, covered, for another two minutes. Remove the soy garlic shrimp from the grill into a bowl and serve this delectable treat immediately. It's important to eat these quickly after removing from the grill. The shrimp will continue cooking for a few minutes after they're pulled off the grill, so you don't want to eat these babies overdone. While the grill is still hot, you might consider grilling a few veggies or even a nice fillet of Copper River sockeye salmon. It'll be great to enjoy a nice appetizer of grilled soy garlic shrimp with a buttery lemon rosemary salmon as the main course, with green beans and tomatoes on the side. Watch the sun set in the West as you enjoy this fine meal with a loved one.